Digital and social media has leveled the playing field for smaller, innovative consumer brands. These new kids on the block are creating personalities, not just brands. And they’re bringing a more engaging consumer experience to the table, setting themselves apart and giving the big brands a run for their money. These brands have a pervasive personality, craft unique experiences and do things that are unexpected. Most of us have probably met one of these brands before. If you have, you most likely remember it. Because it was refreshing. And it felt authentic. It may have even felt like you were interacting with someone, not something. Man, that sounds magical, doesn’t it? I think so. What (or who?) are these consumer experience brands? You probably know them well. They’re not all that new, but they stand as excellent examples and continue to push the envelope when it comes to brand experience. Warby Parker is a ubiquitous brand built on a low price point, great style and owning the customer relationship by doing things that are unexpected. Going through life without a case for your Warby Parkers is no way to live! We’d be happy to send your daughter a brand new case – free of charge. Please confirm the best shipping address for you, and I’ll get the case in the mail as quickly as possible. Let me know if you have any questions, or if there is anything I can do to help! Their email correspondence is conversational. Every communication feels like it was written specifically for the recipient. Note that they make playful use of a site they created as an April Fools prank. They didn’t have to add that extra bit, but they took the opportunity to make a simple customer service touchpoint personal and entertaining. And because of that, Katherine was talking about it. Warby Parker delivers a personal, bespoke experience to each customer. They don’t consider social media part of their marketing department. 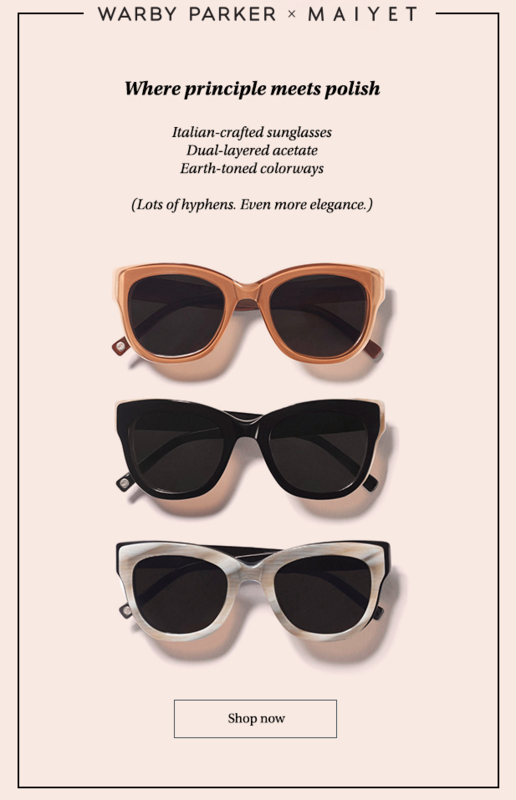 All employees are required to study the style guide, which encourages everyone to “write like Warby Parker is the person you’d want to be next to you at a dinner party” when communicating with customers. If you’ve ever ordered Warby Parker glasses for try-on, you know that they’ve gone to great lengths to craft an experience that feels exciting and fun. Their playful personality translates to their email marketing and beyond – note the cute reference to hyphens. Speaking of personality, Dollar Shave Club and Poo~Pourri each burst onto the scene with video commercials featuring distinct and humorous brand personalities that went viral. Suddenly people were (and still are) watching, sharing and talking about these ads because they wanted to; not because they were asked to. Dollar Shave Club’s CEO Michael Dubin’s smug yet self-effacing nature connects with customers. In fact, the video above enlisted 12,000 customers in just the first two days Dollar Shave Club’s e-doors were open. The brand’s irreverence and authenticity translates through the entire company, its messaging and every piece of content it has created ever since. Consumers are not only buying convenience, they’re buying into an experience. They’re also helping Alejandro make a living. Consumers like to feel good about their choice. Dollar Shave Club’s Instagram is chock full of great examples as well. Don’t wear your heart on your face. Change your blade for the week. Poo~Pourri managed to find a humorous way to talk about a product that might otherwise embarrass people. And they made it entertaining. This takes a little genius – and a sweet personality with a British accent – plus a dash of shock value. Their first “Girls don’t poop” video was wildly successful back in 2013, launching them into the spotlight. They continue to develop messaging and content that is unexpected and pervasively authentic. Everything they do, say and share is uniquely them – from their social media and email marketing to their beautifully crafted bottles and package inserts. While the age of everything digital has played a hand in this movement, we can also thank millennials. Because millennials (according to a bajillion studies) care a lot about experiences. Connect your brand with an authentic experience (and personality), and you’re more likely than the other guy to build brand affinity with the millennial consumer – with other consumers, too. The Dark Side of Google Analytics – What is Dark Traffic?